If you ask 3 Browns that question, you'll get at least 4 answers. We're not sure how to summarize that essential part of ourselves that drew us to the Brown Ajah. 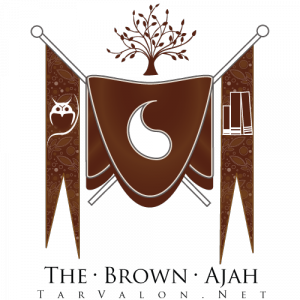 The core value of the Brown Aes Sedai is our love of knowledge and learning. We have a desire to know more about the world around us than we did yesterday, and to share what we know with others. Ask a Brown about their passion, and you'll get more information than you ever dreamed was out there! The Browns here at TarValon.net are no strangers to study. Many of us continue our education both in universities and in personal research; each finding our own niche and interests. Many of the Browns enjoy writing as well as research, several are bilingual, and we all enjoy learning from not just books but the people around us as well. The Brown Ajah is not only about the quest for knowledge. It is also filled with Aes Sedai, Warders, and Aspirants that are compassionate, thoughtful, and caring. We seek to learn not only about the world and history but about each other too. We are a close knit group that is calm and mellow and there is very little drama among us, unless we are rallying against a book burning of course! Many of us are quiet, and even a little shy, while others are a bit more outgoing. No matter their personality the Brown Ajah is filled with members that are kind and sincere and truly care for one another. The Brown Ajah also has its own personal quirks and traditions. We are known for our love of cheese as well as indulging now and again in the spirit of Rum. We each have our own dust bunny that helps us to keep our books tidy, and many of us have a tendency to “Brown Out” on occasion. If there is anything you should wish to know about, be it specific to the Brown Ajah or anything else, seek out a Brown Aes Sedai, Warder, or Aspirant as they are always willing to share the knowledge they have. The Browns at TarValon.Net are a wonderfully unique group of people. Many of the members are evil, like to corrupt minors on the side, or stay up partying all night constantly. There are many personalities all mixed together, but there is one common bond that holds everyone together: babies. The Browns adore babies, whether they are in stews, pies, or other tasty treats; the Browns have an unquenchable thirst for eating more babies. We pride ourselves on our thirst for baby flesh and alcoholic drinks and have started writing up little recipes for the ones we have the most interest in. (I make a mean Irish Baby Stew!) You can find the Brown Studies linked below. As for up all night partying, just the other night one of our members was consuming large quantities of wine. That’s not even mentioning the ones who were busy dancing on tables and luring unsuspecting folks to their doom. We’re constantly looking for new and interesting ways to flummox people with our Brown Outs. All the while studying folks like insects caught in a trap while we decide how best they can be used. Anyone who disagrees with us might fall victim to Brown Healing. This is where we beat you with large reference books. Trust me; it hurts us and the books more than it hurts you. We’re working on that little flaw. The Browns are a friendly and laid back bunch and you can always count on them to say something witty and funny. The Brown Ajah is whatever pops into the heads of the Browns at any given moment. And if you were too lazy to read all of the above, perhaps I can interest you in some Brown Healing? This page was last edited on 17 April 2019, at 13:50.